Receive the latest posts directly to your inbox every week! The first edition of Mansions of Madness was one of the most deeply problematic games that Fantasy Flight Games has ever released. On paper, it sounded great- story-driven, RPG-style adventures in the company’s Arkham Horror setting complete with puzzles, detailed combat outcomes and a real sense of investigating Lovecraftian mysteries. But it had quite a few terminal issues. The setup was tedious and a misplaced card could throw the whole game. It was reliant on one player acting as a game master, which was another failure point if that player wasn’t up to speed with the rules or if they found themselves in a position where they could win the game…or show mercy just to keep it fun for everyone. The manual puzzles were cute but gimmicky. And the whole thing was riddled with errors, inconsistencies and typos necessitating an errata sheet in the box and FAQs at launch. The game is back in a new second edition (complete with an upgrade kit for legacy owners) and this time out, they’ve gone digital. Leveraging a similar software design as employed in the excellent digital implementation of Descent, the game mastering role has been moved to your smart device along with all of the setup instructions, scenario information, storytelling prompts, monster AI and puzzles. This sounded like a can’t miss opportunity to redeem Mansions of Madness, a game I always felt had a lot of potential that was not realized. However, I’ve been left quite disappointed by the new version. Designer Nikki Valens has made some significant improvements to Corey Koniesczka’s original template, but once you strip out all of the rules bulk associated with running the game it turns out that there really isn’t much that is compelling about Mansions of Madness. It’s a simple adventure game filled to bursting with random events (and I do mean random, as in “your tongue is suddenly too large for your mouth”), skill checks and light exploration. Mechanically, it’s not far removed from Betrayal at the House on the Hill but this game is, at least more stable. Four scenarios are shipped in the box- well, not in the box, on the well-produced app. 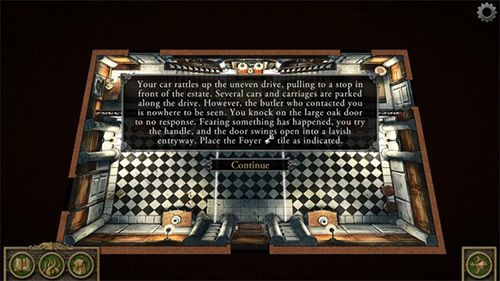 Each is a pretty decent imitation of a Lovecraftian-influenced pulp story that finds the player-investigators poking around some building or environment tiles, looking for evidence or other objectives to complete the story. Of course there are items of varying dispositions and utilities that can be found, and needless to say madmen and monsters abound that need to be burned, stabbed, magic-ed, shot or bludgeoned. The game deploys the damage cards (both physical and mental) straight from X-Wing, where a face down draw just subtracts from your wellbeing, a face up one provides a narrative effect that may have ongoing consequences. So you’ll set it all up in the app and the game will tell you where to put everything in a room, alley, boat, or what have you. Each investigator gets two turns, and if you are not fighting something or moving you are probably going to search “hot spots”, open doors, or engage in other interactions by tapping their icons on the screen. And the app tells you what to do- maybe you’ve opened the fridge and it’s a portal to Yuggoth- take two mental damage, roll a will check to negate. Once all of the investigators have had a go, you tell the app this and then it performs the Mythos phase and instructs you how to move monsters, make horror checks and so forth. The app does a lot of good for the game in terms of making it easier to play. It reduces the cards and physical components required to play it tremendously. The touchscreen puzzles are a vast improvement, although they lack variety. I do especially like how you can pick up a puzzle box item, carry it with you, and work on solving the puzzle later on, when you are not dodging a Hunting Horror. Or maybe while you are doing so, the game doesn’t forbid it. I also like how one of the coolest things about Mansions of Madness has returned, how the game gives specific combat narrative and results based on the type of weapon you’ve used- so you’ll get a different skill check and an outcome if you shoot something than if you stab it. I’m also glad to see some elements of Eldritch Horror- the best Lovecraft game FFG has published to date- return, such as the flip-over cards. I like not knowing exactly what the outcome of a spell will be. There is a bit of weirdness in that one of the conditions is “Insane”, which basically makes one player a traitor with a secret goal on the reverse of their card. So, oddly, one player can win out of nowhere just because they’ve got this condition. For example, there is one where if your character is in a room alone with another and you have a knife (you get the picture), you win. That’s an awfully frivolous, albeit likely uncommon, outcome for a group game where the goal is telling a story, not “winning”. The storytelling is really the heart of the problem. 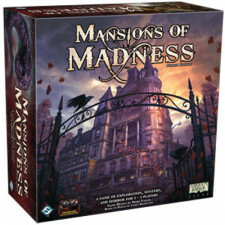 Mansions of Madness was, and is, one of the more specific attempts to translate the role-playing experience to a board game. For some reason, folks out there still haven’t wised up to the fact that if you want an RPG-like experience, the best and easy way to do so is to play an RPG. Board games are simply not equipped to tell the kinds of immersive, emergent, and free-form stories that RPGs can, and this game highlights the shortcomings of the board game RPG concept in giant, neon letters. For one thing, the app is not really reactive. It’s dumb. It doesn’t know where characters are, or what they are doing. There is no AI. If a monster can’t reach a character because of a fire, barricade or other obstruction, you still get the move prompt and it just doesn’t move. A real, live game master would react to the situation and change the story as it happens to make it more fun and interesting for all involved. The app can’t do this. The social exchange between players and game master is reduced to tapping through prompts and rolling dice when your iPhone tells you to do so. Likewise, a game master would never drop the “your tongue grows too large for your mouth” on a group twice. I’ve only played through the game three times and I’ve seen lots of repetition and it is also clear that random events and occurrences aren’t even tailored for each specific scenario, which is really a shame since the app should have enabled that. The app concept worked in Descent because that game is a tactical skirmish game with objectives. It does not set out to tell a specific adventure story. It moved the monsters, set the stage with a couple of lines of text, and told you where to put the treasures. The XCOM app also worked great because it provided a formidable adversary and controlled the flow of the game. 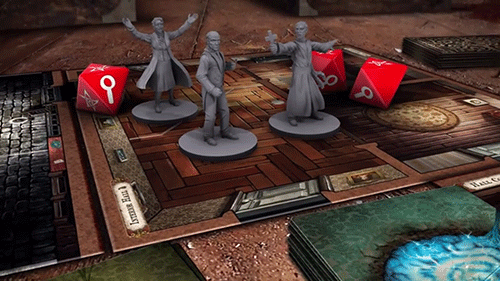 With Mansions of Madness, it too often feels like playing a very simple point-and-click game where everything but the map is on the table instead of in the video game and there’s dice instead of an in-app RNG. Worst of all, the game is just plain boring. 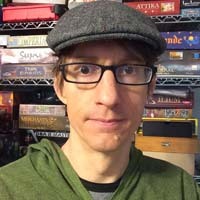 The mechanics simply aren’t there, and this is coming from someone that generally likes flip a card/roll a die adventure games. The storylines are decent and there is a (mostly) logical flow to them, but playing through them becomes tedious. Granted, this is largely dependent on who you are playing with, but the two groups I have played the game with haven’t been terribly enthusiastic about it. The game supports solitaire play, but it is completely soulless without having others around to crack wise and joke about the proceedings. To add insult to injury, they’ve once again included the same junk miniatures from the first edition with those gigantic bases for some reason, which makes me dislike this game even more. So I’ve found this update to Mansions of Madness to be more of an indicator that there really wasn’t much there to begin with than it is that there was something worth salvaging. It’s time for me to just state flatly that I do not care for this game. The app takes a lot of misery out of the original game, but it also jettisons the reflexive interaction between referee and player that RPG-style storytelling needs to thrive.